We will look into an instance of Schwarzschild spacetime with Excel. For me, as a beginner of general relativity (GR), difficult points of common textbook were that most formula are written in abstract manner like Einstein’s summation convention, and that explanation is too smart to understand from the bottom of heart. So, I showed explicitly expanded matrix elements and built them into cells in Excel work sheets. By them, we can see not only calculated physical values of a concrete instance, but also calculation formulas and their structure. Furthermore, I showed a couple of different ways to derive the same results. This contributes to strengthen our confidence. With following Excel file, you can change parameters in light blue cells to get corresponding result. *Right-click the upper item and save the linked Excel file to your computer. In this Excel file, the situation that a test mass m is free-falling from infinity to the gravitation source M whose Schwarzschild radius is a is studied. 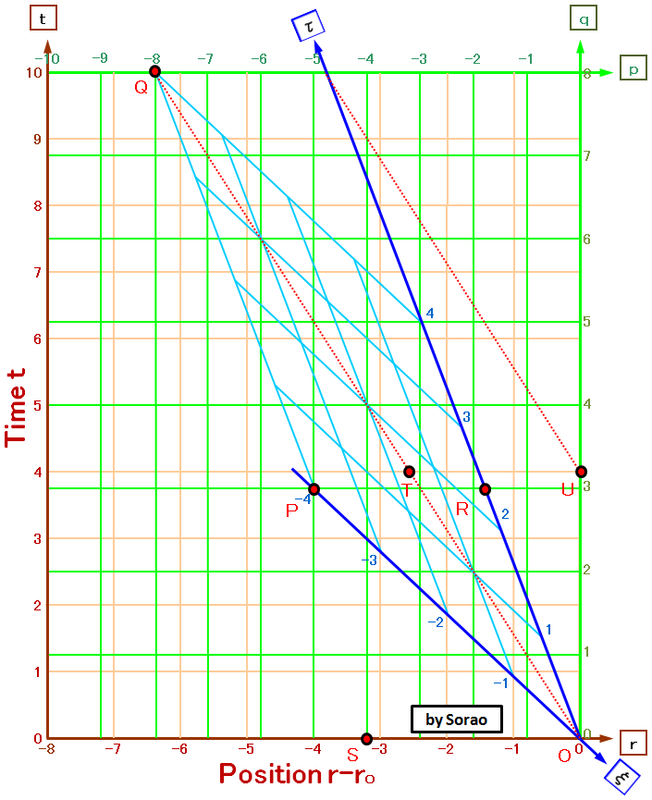 To get an orderly geometry, default parameters was chosen to be r0/a = 1/0.36 = 2.777… , where, r0 denotes current position r of the free-falling test mass m. Origin of all coordinates are set at r=r0. Default point of interest is set at (10, -6.4) in Eulerian coordinates. We study how this point is expressed in other coordinates. In many textbook, Eulerian coordinates which is fixed to an observer at infinity and Lagrangian coordinates which is fixed to an observer who is free-falling with the test mass m is studied. On the other hand, In this study, I adopted Stationary coordinates (coined term by present author) which is fixed to an Stationary observer at r0 between them. 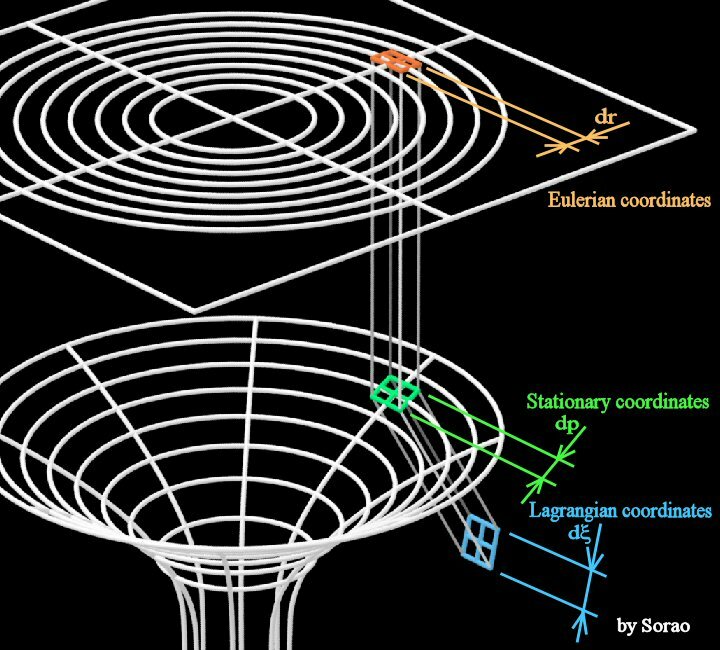 Features of Schwarzschild spacetime is laid only on Stationary coordinates, and I considered Lagrangian coordinates as Lorentz boosted Stationary coordinates. About Christoffel symbols, metric, unit vectors, contravariant and covariant components, you can understand the structure of their origin by tracking the formulas built in the cell. This might not be in proper order, but I add basic explanation for beginners. In the first place, general relativity begins with the concept that you can adopt any coordinate system you like. When there is a substance, you can use whatever coordinate system you like to express the property of the substance. If so, it is convenient to use non-distorted coordinates for a person who lives there. This is the Lagrangian coordinates. For a person who lives in a spaceship which is free-falling in the distorted space near a large gravity source, the space in the spaceship is not distorted at all if tidal force is small enough. For him, Lagrangian coordinates which is fixed to the spaceship are non-distorted ordinary coordinates. If he looks only inside of the spaceship，he has no means to know if the space in which his spaceship is flying is distorted or not, except for tidal force. As long as he use this Lagrangian coordinates, all rules of Newtonian dynamics is perfectly applied in the spaceship. This is called “equivalence principle”. But for a person far from the gravity source, the person in the spaceship is observed distorted together with his Lagrangian coordinates. The coordinates for a person far from the gravity source is called Eulerian coordinates. Speed of light is c for every one. This is called “principle of constancy of light velocity“. But strictly speaking, this is true only around the vicinity of the particular observer. In Fig. 2, because point O is far from Eulerian observer from the perspective of general relativity, speed of light is observed slower by Eulerian observer. On the other hand, the Stationary observer stays at r = r0 regardless of time, and Lagrangian observer stays at point O when t = 0, and proceeds along τ axis. Both observers stay near r0 from the perspective of general relativity. So, speed of light for these two observer is 1. Concretely speaking, light proceeds distance of one graduation in the time of one graduation for each observer. Describing what special and general relativity is doing simply, I think, they are mapping ordinary physical phenomenon for Lagrangian coordinates to Eulerian coordinates which is for a person far from the gravity source ( ≈ us) with complicated mathematics. All copy right is reserved by Sorao. But anyone can download and use this file for free. You can also modify this sheet by unlocking the “sheet protection” without keying password. Putting this file or modified file (exceeding the level of citation) on your website or publicly accessible place is NOT permitted. Please post a link instead. Link to the top page http://doppolaboratory.com is appreciated. This file could be revised at any time. Although it is carefully examined that contents is not in discord with common view and method, and that results from several different methods are corresponsive, as this author is an amateur physicist, this is not guaranteed. Comments and indications are welcome. The terminology about Eulerian coordinates and Lagrangian coordinates were wrong.